That’s one of the biggest mistakes we usually make. Job descriptions capture tasks and activities in a utilitarian way — they were originated to define and outline tasks related to a particular role. The problem is that job descriptions don’t capture the essence of a role — they fail to address what drives people. You wouldn’t post yours and brag about it on social media. It’s not a surprise then that, when discussing the future of jobs, we use the same utilitarian approach — technology can easily perform any task humans do. But what about the meaning behind a job? Every job has a (human) purpose for both giver and receiver — it has social and emotional benefits. This post is not about technology versus humans. It’s an invitation to approach the future of work in a balanced way. The two must collaborate rather than compete against each other. However, we first need to define what kind of workplace (or world, for that matter) we want for us, humans. Technology must be at the service of humans and not the other way around. Many companies pay lip service when they say they are purpose-driven, yet fail to design a human-first approach to work. Even the most insignificant job has meaning. Take janitors, for example. They take care of unrewarding tasks without disturbing ‘important’ people — janitors are invisible to most of us. At first glance, a janitor’s job description is straightforward. It’s full of unremarkable chores: mop the floors, sweep them, empty the trash, restock the cabinets, etc. None of the things on the list involve other human beings — a machine could perfectly replace a janitor. Yet, as Barry Schwartz explains on his memorable TED Talk, psychologists were surprised after interviewing hospital janitors — they felt their jobs revolved around human beings. Researchers encountered Mike, who told them about how he stopped mopping the floor because Mr. Jones was out of his bed getting a little exercise up and down the hall. Charlene told them how she (ignored orders) and didn’t vacuum the visitor’s lounge because some visitors spent the whole night and were now having a nap. Or Luke, who washed the floor in a comatose young man’s room twice because the man’s father was angry because he didn’t see him do it the first time. Behaviors like this don’t just make people feel better — janitors improve the quality of patient care. Meaning is in the eye of the beholder. It’s our duty for those advising companies to remind our clients of this key insight. Categorizing certain jobs as meaningless is pretentious — we, as experts, assume certain jobs are cool and others just mundane. When asked about the difficulties of their job, janitors said that it requires lots of experience. They weren’t talking about how to mop floors — learning how to care for people is what takes lots of experience. Janitors find meaning in a job that seems mundane — they apply kindness, care, and empathy. Yet, their job descriptions had no word about other human beings. Work is less about what we do — the impact it creates on us and others is what drives meaning. Do we work because we have to or because we want to? According to Neel Doshi and Lindsay McGregor, the authors of Primed to Perform, there are two types of motivation: indirect and direct. The more external the forces, the less meaningful work becomes. 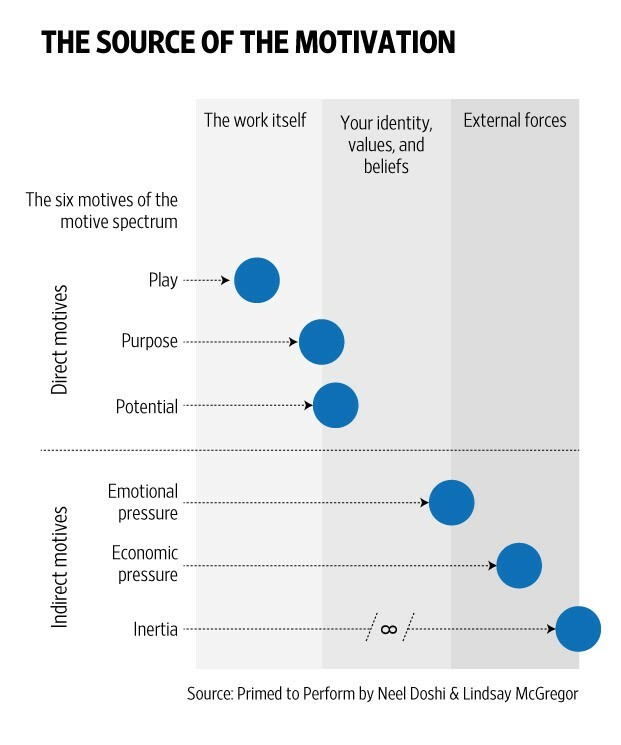 Motives that don’t connect to the work itself reduce overall performance. This group is basically driven by external forces — we feel disconnected from our work. Inertia means working without being mindful about what we do. We have a distant relationship with our jobs. Every day feels repetitive, boring, and predictable — we are working on autopilot. Economic pressure is more than just needing the money. Work is a way to earn a salary. However, the authors’ research shows that income and the economic motive were statistically unrelated — people at any income level can feel economic pressure at work. Emotional Pressure is the weakest of the indirect motives. It’s about doing something to please other people’s expectations or social judgment. You care more about the image your job projects than the work itself. This group is closer to the work we do — it creates both meaning and excitement. The Potential motive is when you do the work because you feel it’s essential — it helps you achieve your personal goals. For example, you decide to eat healthfully to run faster not because you want to look nicer and please others (emotional pressure). The Purpose motive occurs when you do your job because you value the outcome — you care about what you can achieve, regardless if the activity is rewarding or not. The job of a nurse is anything but pleasant, but helping patients is highly rewarding. Your job feels purposeful when its aligned with your values and beliefs — the outcome is relevant and meaningful. However, for many people, the fact of being employed gives them meaning (versus not having a job). You don’t need to discover a cure for cancer to feel that your makes is meaningful. The Play motive is strictly connected to the work itself — you engage in an activity because you enjoy doing it. Experimentation, curiosity, and personal growth are at the core of play. Scientists describe this motive as ‘intrinsic’ — the work itself is its own reward. Play means having fun doing your job. It’s not having fun per se (like playing video games at work), but that you enjoy what you do — it energizes you rather than drain you out. Productivity is a byproduct, not an outcome. Allowing people to do their jobs for Play, Purpose, and Potential creates the highest and most sustainable performance. Unfortunately, most managers see productivity as a goal, thus trying to incentivize their teams with indirect motives. People work to earn money, but they don’t work just for the money. That’s the point that Universal Basic Income promoters miss. People want to feel proud of what they do; not to stay home waiting for a paycheck to arrive. Intrinsic Motivation, as I mentioned earlier, is the most effective — it arises from within because it is naturally satisfying. Purpose sometimes feels overrated — find your ‘why’ they tell you and everything will work out fine. Purpose alone is not enough. However, success without purpose is unrewarding. Daniel Pink, in his book Drive, proposes an upgrade to old ‘carrot-and-stick’ motivation approach: Autonomy, Mastery, and Purpose. Purpose is not just about the why (what drives us) but also about the what for (the impact we create). In the case of the janitors, it means caring for other people. You could have a high mid-six figure job and feel miserable. Either because you work in a toxic work environment or you are doing something that goes against your values. Mastery is getting better and better at what you do daily. It’s finding variety and challenges — you are always learning on the job. Mastering your job is what turns work into play — it becomes something you want to do, not that you have to. Cal Newport, in So Good They Can’t Ignore You, talks about the ‘Craftsman Mindset.’ He considers mastery as the first step in crafting work we love. The leverage of a valuable skill can make our working life increasingly fulfilling. The author believes that you can’t find (work) love at first sight. Do what you love or love what you do? I say both. I disagree with the author though — many people can find purpose early in their career. However, as Newport cautions, to put purpose at the front of everything can make many people frustrated and stuck. Sometimes, you must learn to become good at something to find it fulfilling. Either way, you must put the effort to find true meaning. Which takes us to Autonomy — we all want to feel we have choices. We want to have control over our tasks (what we do), time (when we do it), team (who we do it with), and the technique (how we do it). People want to feel ownership –telling someone how to do their jobs kills motivation. A wise person knows when to break the rules, like the janitors who sometimes adapted their duties to other people’s needs. Breaking the rules with a purpose doesn’t create chaos when people care about the collective good. Going back to job descriptions, let’s avoid the mistake of developing technology with the same utilitarian approach to work — to replace the functional side of a job. That’s the challenge that technology — unempathetic industry — must solve. How can we program wisdom into an algorithm? This goes beyond pre-defining what’s right or wrong — practical wisdom requires to walk in other peoples’ shoes. In other words, how might we clean a hospital and make someone else’s life better in some small way? Everyone’s role in an organization goes beyond their functional job — they influence other people’s behaviors. Collaboration is not about getting along with each other. Our colleagues have different personalities and skills — diversity of thinking makes powerful teams. Other people see things differently and challenge us — we raise the bar through social interactions. I’m not worried about jobs per-se. While many jobs will be replaced or disrupted, many new ones will be created — as it’s been happening in the past years. The point is how will people transition from one to another without losing meaning. How will new jobs keep people motivated by allowing them to have purpose, autonomy, and mastery? The race for developing and adopting new technology can blind organizations. Technology is a means to an end, not the end. Don’t let the hype cloud your judgment — don’t let the tech industry’ agenda overshadow the human factor. We are driven by meaning — every job has a human component and impact other human beings. Technology shouldn’t replace but complement people — let’s move from competition to collaboration. The technology craze has oversimplified what work means — it’s trying to convince us that jobs are just functional. But there are more than just utilitarian. Artists work, and so do philosophers, doctors, teachers, and janitors — their jobs bring meaning to our lives. What world do we want to live in? Let’s design a human-centered world first. And then, only then, define how technology can help us bring out our best selves. In the workplace and beyond. Download my ebook “Stretch Your Team: how to thrive in a changing world”: get your free copy. The Undervalued Purpose of Work was originally published in Stretch for Change on Medium, where people are continuing the conversation by highlighting and responding to this story. Reach out: [email protected] Or follow me on social media. I love to chat with my readers.